Publisher's Note: Products purchased from 3rd Party sellers are not guaranteed by the Publisher for quality, authenticity, or access to any online entitlements included with the product. Master Techniques in Orthopaedic Surgery: Orthopaedic Oncology and Complex Reconstruction focuses on bone and soft tissue tumors, which are among the most challenging problems for orthopaedic surgeons to manage. The book is broad in scope and includes coverage of massive reconstruction following trauma. The international authorship includes outstanding surgeons from Germany, Austria, Italy, Australia, and Great Britain in addition to the United States. The contributors describe their preferred techniques in step-by-step detail, point out pertinent anatomy, and offer pearls and tips for improving results. The book is thoroughly illustrated with full-color, sequential, surgeon's-eye view intraoperative photographs, as well as drawings by noted medical illustrators. Although bone and soft tissue tumors are relatively uncommon, they are among the most challenging problems for orthopaedic surgeons to manage. Most of the more difficult problems are left for the subspecialist to treat. It is an area which is much more international in scope than more common problems like the treatment of fractures. 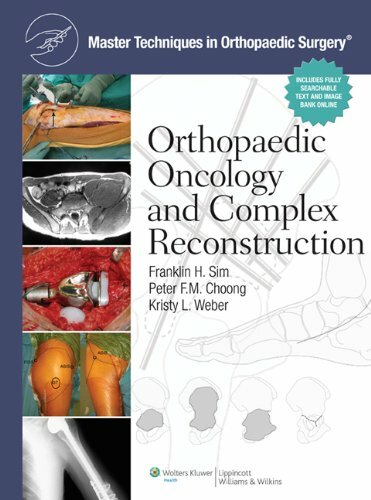 Master Techniques in Orthopaedic Surgery: Orthopaedic Oncology and Complex Reconstruction will be broad in scope and include coverage of massive reconstruction caused by trauma. It will also be international in authorship, with authors from Germany, Austria, Italy, Australia and Great Britain in addition to the United States.